One of the most complex and ingenious chronographs is back! First introduced in 2006 in the elegant DB21 case, relaunched in 2014 in a more modern DB28 case, the De Bethune Maxichrono was and still is one of the most fascinating and mechanically impressive chronographs of the lot. 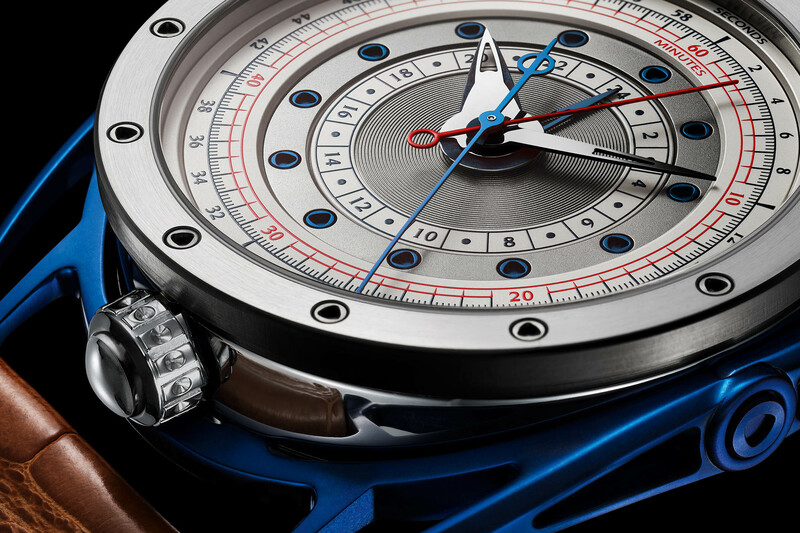 Functionality, mechanical ingenuity, beauty of construction and decoration… A sort of dream-chrono. Denis Flageollet’s vision of the chronograph is back (but in very limited production), with the De Bethune DB21 Maxichrono Reedition. The common vision of the chronograph usually relies on a watch with multiple sub-counters – 2 or 3 in most cases, with the time indicated by central hands. This classic construction has been rivalled a few times and mastered even fewer times. Recent examples include, for instance, the Singer Reimagined Track 1 and its AgenGraphe movement, which also rely on central indications for the chronograph (but that was after De Bethune and the creation of the Maxichrono). 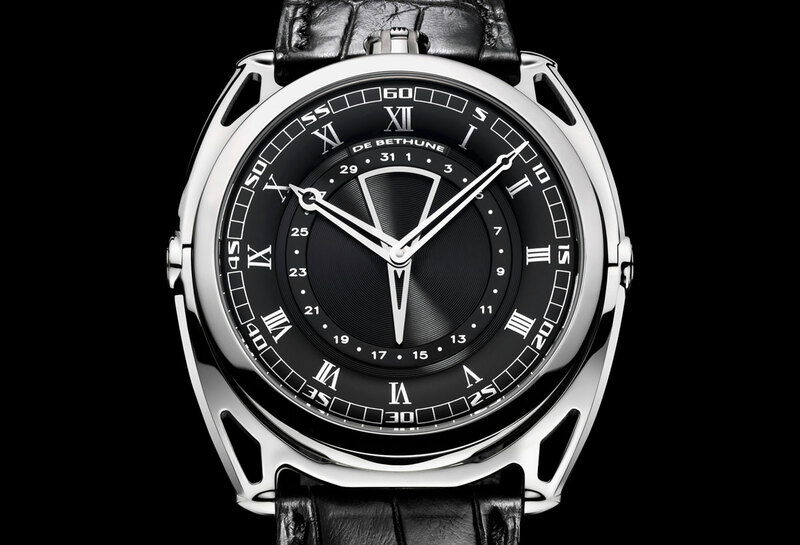 What Flageollet and his team did in 2006 was to make the chronograph more contemporary, more legible, more “clean”. How? By removing all the sub-counters and placing no fewer than five hands on the central axis, including the three hands that display the chronograph, which are read as classical hands. Having five hands on a single axis is already challenging in itself. However, when two of these hands can be adjusted (hours and minutes) and three need to have a reset system, things become ultra-complex. 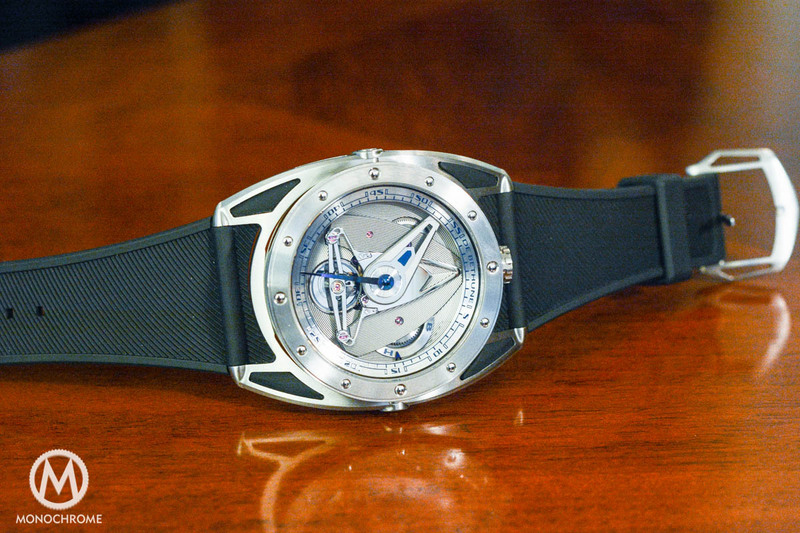 By revisiting the chronograph, De Bethune has created a true watchmaker’s challenge. All the hands need to be inserted one into another in a single canon and three of them feature a brake and a heart-cam to be started and stopped. 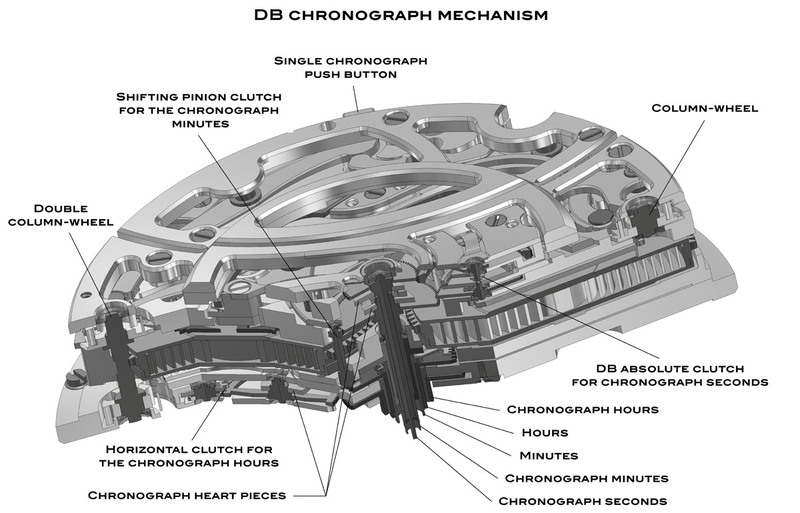 The chronograph’s seconds hand, the 60-minute hand, and the 24-hour hand are all co-axially mounted in the centre along with the hour and minute hands. Technically complex, the result is a watch where the chronograph indications are read in a “normal” way, with elapsed times up to 24 hours. Achieving such a complex display and actuating the chronograph by means of a mono-pusher located at 6 o’clock (in the crown) required De Bethune’s watchmakers to re-think the construction of the movement. The calibre DB2030, manufactured in-house (of course), is first a high-frequency movement with a 36,000vph frequency – allowing measurements of 1/10th of a second. 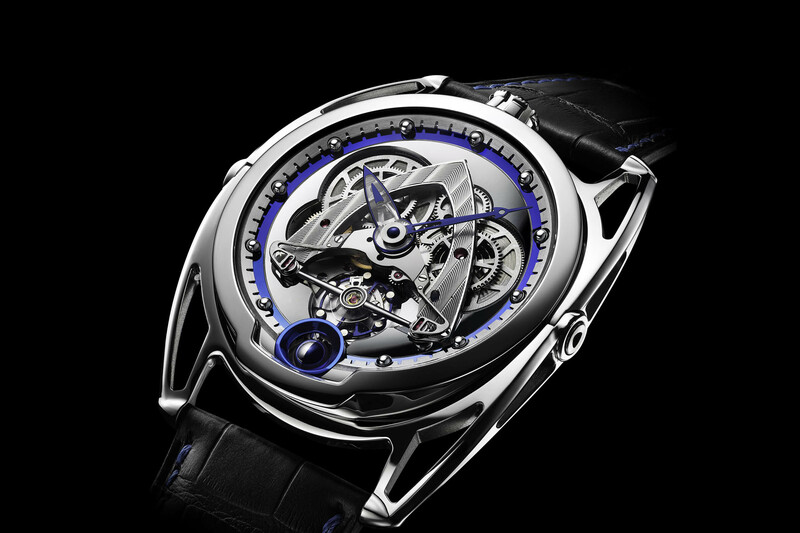 Furthermore, this movement features a device named the “De Bethune Absolute Clutch”, a piece of complex machinery that comprises three column-wheels and three different clutches. Three different types of clutches, behind three semi-independent systems, controlled by three column-wheels, govern the different chronograph elapsed-time counters. The calibre DB2030 is equipped with De Bethune’s self-regulating twin barrel, which provides 5 days/120 hours of autonomy when fully wound. 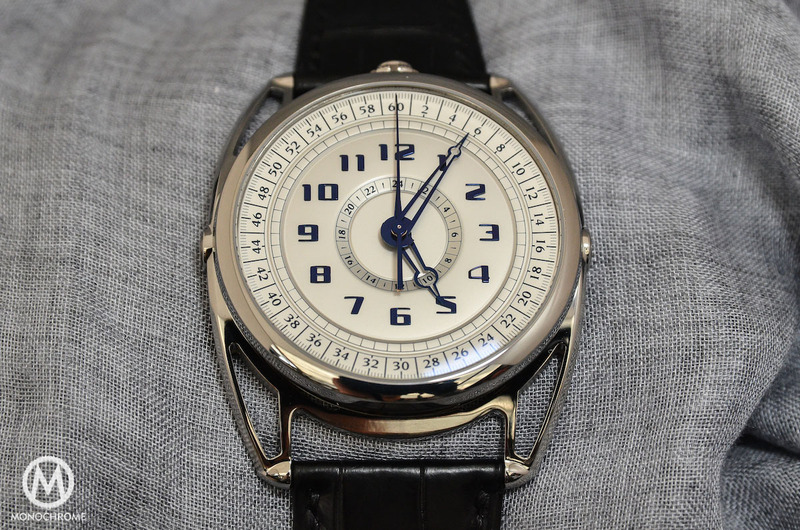 The regulating organ is De Bethune’s titanium balance wheel with white gold inserts linked to De Bethune’s balance-spring with a flat terminal curve and a silicon escape wheel (let’s agree that chronometry should be good). The movement is finished in the usual superb De Bethune standards, with greatly designed bridges revealing most of the technical parts. The bridges are mirror-polished, sandblasted and snailed by hand and all the steel parts are polished and chamfered by hand. 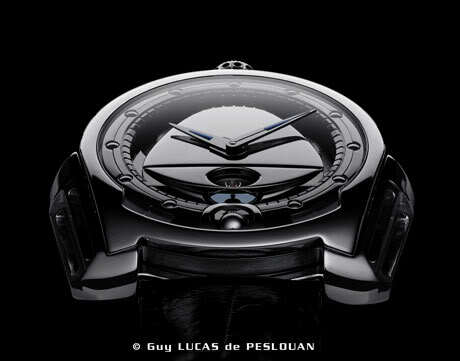 For the occasion of this “relaunch”, De Bethune offers a 10-piece limited edition named “DB21 Maxichrono Re-edition”. 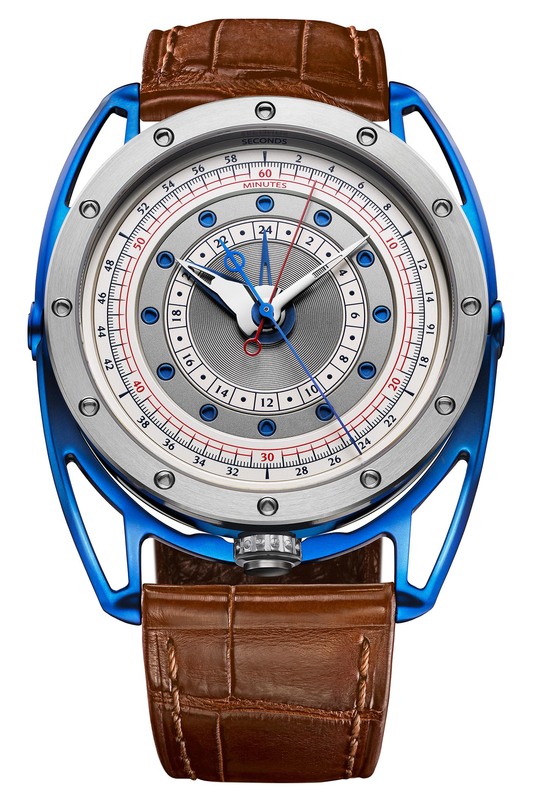 For the first time, it is presented in a grade 5 titanium central case with blued grade 5 titanium floating lugs. The dial follows the same idea, with a combination of a silver-coloured plate and blued details. The bezel is also new to this model, with a brushed finish and 12 screws to indicate the hours. 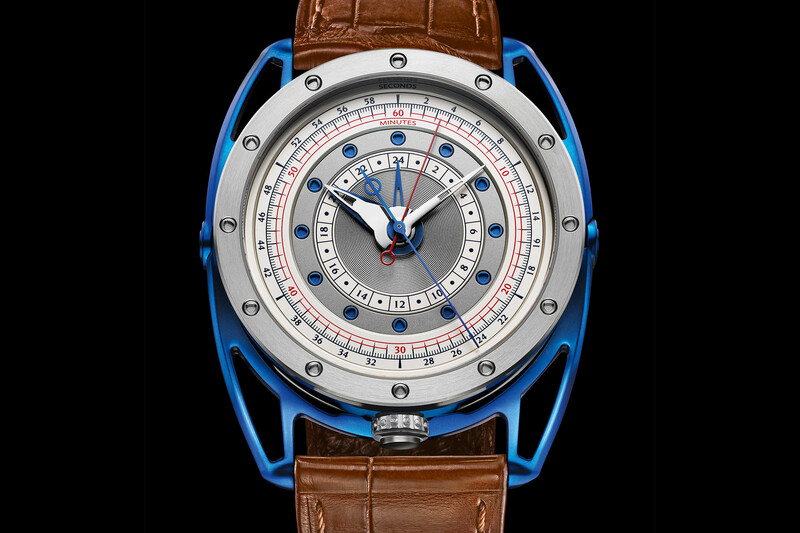 Price for the De Bethune DB21 Maxichrono Re-edition will be CHF 155,000 (excl. taxes). More details at www.debethune.ch.